Ever wondered why the Dunn Memorial Bridge provides a ramp to thin air? Why the Livingston Avenue exit of I-90 is so overbuilt, and ends so abruptly? Why there are extra tunnels underneath the Empire State Plaza? Or why Corporate Woods has its own highway exit? They're all vestiges of a highway system that was never built. 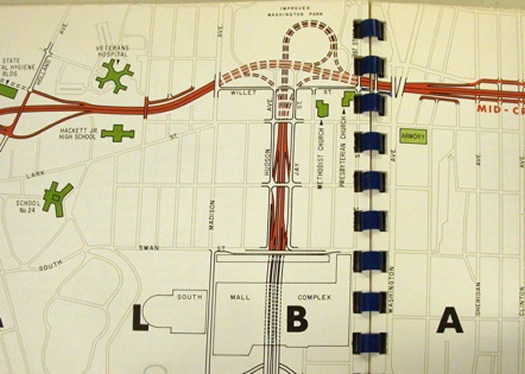 In the heyday of urban highway planning, there was a lot of high-speed concrete planned for Albany. 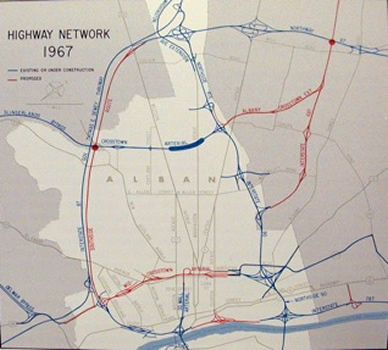 Starting in the 1950s, there was a plan to build a Northside-Northway Connection, which would have been I-687, from the still-to-be-realized Exit 3 of the Northway through Colonie to Exit 5A of I-90. 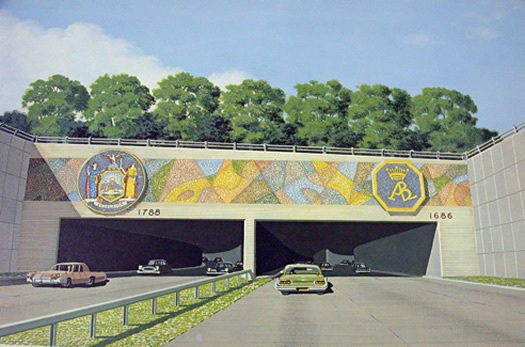 There was a Southside Route which would have perfectly paralleled the Thruway from Exit 24 to Exit 23, with a convenient connection to Route 85/Slingerlands Bypass, which also would have continued north to I-687. 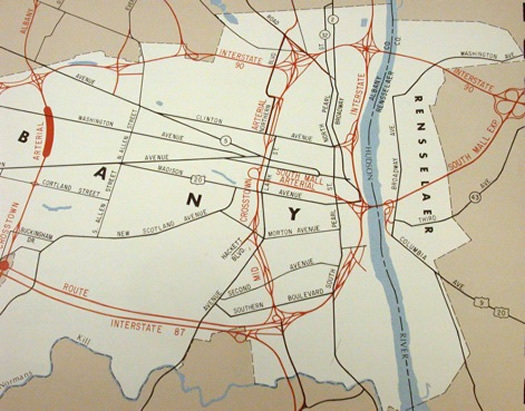 The South Mall Arterial was to have connected the Empire State Plaza complex to I-90 across the river, splitting the City of Rensselaer. Any of these proposals would have had a tremendous impact on Albany and its immediate suburbs, but perhaps none as dramatic as the Mid-Crosstown Arterial. 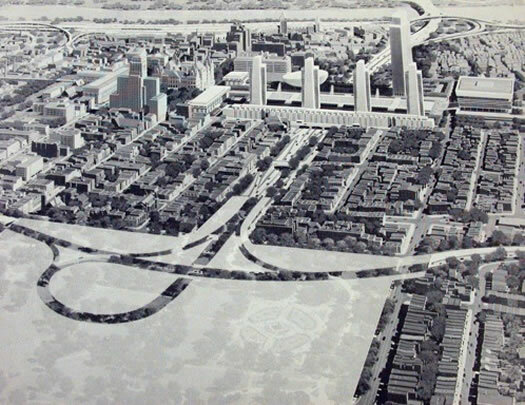 First appearing in a 1950 proposal, the Mid-Crosstown Arterial would have run from Exit 23 of I-87, north through the heart of the city to I-90 at Livingston Avenue. Halfway along, there would have been a massive connection to the South Mall Arterial, right at the eastern edge of Washington Park. For much of its route we would have had a sunken four-to-six lane highway cutting through the very center of the city, except where it would have run through Washington Park. Even highway planners of 1968 had to admit there were detriments to a plan that required the taking of a chunk of Albany's most historic and beloved park, so they came up with a solution -- they'd bury the highway and its connection to the South Mall Arterial underneath the park. The connection between the two highways would have been entirely underground. To the east, the road would have daylighted at Dove Street, filling in the space between Hudson and Jay that to this day is filled with pesky houses instead of sweetly flowing traffic, all the way to the Empire State Plaza and points beyond. Let it not be said the engineers behind this vision were without souls. After all, they rejected the option that would have torn down every building on Willett Street (save the Presbyterian Church and one other) in order to run the highway interchange along the edge of the park. In fact, their option of building underneath the park was touted as the most feasible location for the interchange "from the standpoint of preserving the local community structure." The interchange would preserve the park in its entirety, and Willett Street and all the buildings to its east, "except those between Jay Street and Hudson Avenue," would be untouched. So the local community structure would only have lost about 350 buildings, displacing 750 families -- small change in comparison to the impact of the Empire State Plaza. 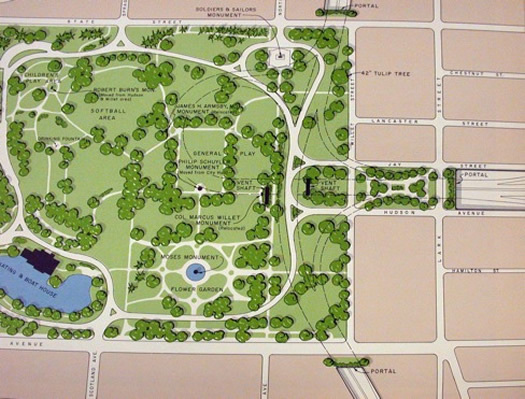 There was even the promise of a "restored" Washington Park, most of which seemed to involve moving some of the statues around and adding a block of parkland to the east where the buildings would have to be taken out for the South Mall Expressway tunnel. We came perilously close to seeing this vision of high-speed access to a gutted city come to fruition. Those strangely overbuilt (and misaligned) ramps connecting Northern Boulevard to I-90 were the beginnings of I-687. Those tunnels under the Empire State Plaza that are used for storage were to be the other lanes of the Expressway. That oddly abrupt ending to the Dunn Memorial Bridge was meant to extend out over and through Rensselaer. The interchange that would have led drivers from I-90 to I-687 was completely constructed before local opposition, changes in highway plans, and funding priorities killed I-687 -- which is how Corporate Woods came to have its own highway access. And the plan to run the Mid-Crosstown Arterial through, or under, the park led to vociferous opposition from neighborhood groups, which were just beginning to coalesce around issues of preserving Albany's history and heritage. Credit to the website for Capital Highways for background info on some of these projects. Carl writes about "random pieces of history from New York's Capital District" at his blog, My Non-Urban Life. great post. i was always curious about that, and had heard about roads that were planned, but never built. Any chance the maps could be enlarged? (or linked to larger versions)? And now the real reason we have no Exit 3 has been revealed and now I can finally tell my out-of-town friends why we can't count. This was a really awesome post. @Fred: We're working on it. We'll update. I am strangely at peace now that I know the full answer to the the mystery of Exit 3. Makes you wonder how long it would have taken and how Albany would be different had it been finished. Boston's big dig took what, and I could be way off, 20 years to finish? If you had asked anyone there midway through if it was worth it, 99 out of a 100 would have said no. But look at it now, it really did make the city nicer. You know, besides the 2 ton cement sections falling in the tunnels. Thanks, Carl, for filling in some details on this subject that has always fascinated me - although I have to agree with Fred that those photos are more torture than help, suggesting the existence of more detail still out there! What I've always thought would be amazing would be to do a book exploring the proposed route of this 50s/60s-era highway paradise. Go from neighborhood to neighborhood through the route, looking at what was there then and what's there now, and throwing in a dose of "alternate reality" to envision what would be different if the highway system had come to fruition. Would Loudonville still be full of old money if it had been bisected by I-687? How would the paths we take every day from place to place be different? Awesome post, thanks for clearing up so many burning questions! It's hard to believe that there were more plans in place to ruin Albany with ill-conceived highways, considering that 787 already cut off the city from the waterfront. I can't even imagine what Albany would look like had any part of this proposed plan been implemented. Yikes. Great post. Take a walk down to the Hudson/Jay dog park and strike up a conversation with some of the older residents of the neighborhood. There are many who still live in the same "doomed" houses that were very involved in fighting off this monstrosity. While the plan to dig may have preserved the park in purely physical terms, imagine what it would be like with multi-lane roads coursing from it on three sides. The park may have still been there, but not its soul. Similar things happened in Troy. I-787 was originally to cross the Hudson at the Menands Bridge, cut thru south Troy, then downtown along Fifth Ave to a junction with the never-built I-88 going east to Bennington at Hoosick St. (That's another story.) After opposition from Fifth Ave residents, DOT moved the route to the hillside below 8th St and a lot of buildings were torn down there, as well as in the Little Italy section south of Congress and Ferry streets. Then folks in South Troy said they'd dynamite any construction equipment, the route got switched, and Watervliet was gutted and separated from the river, instead of Troy. The other problem with "taking" the park lands would it require a lengthy alienation procedure -- requiring two home rule messages the passage of two alienation bill by the legislature, and signed by the governor. This would be slow and uncertain. The City would also be required to create double the acrege of new park lands in other parts of the city to make up for the lost. The alienation law of that era would have allowed them to do the cut and cover in the park, without requiring the legislature to alienate the land. This law has changed --- lands must be alienated even if the public is temporarily denied access to them-- see Friends of Van Cortlandt Park court case. This connects to the post about Albany's lack of traffic. Can you imagine how empty the highways would seem if all of these proposed connections were built? What a waste. Thank God it never happened. The Empire State Plaza destroyed enough homes. Fascinating post! To expound upon Erik's comment, isn't that why Hudson/Jay park is there? Because they actually did knock down some houses before the project stalled? It's scary to think of how close we came to Center Square being...well, not. Phew. Great article! I've always wondered about some of those random terminations on the highway system.... and why 787 brutally cut off downtown from the Hudson. Greaaaat urban planning. Thanks to everybody for the response to this story. To a couple of the points and questions -- If you want to see what a city looks like where this kind of vision came true, just look at Syracuse, where two major interstates quarter the city, creating concrete divides and blocks and blocks of wastelands. Just a few years after getting the trains off their main streets, they cut up the city, much to its detriment. Much of Albany's MCA would have been sunken, limiting crossings to select bridges -- like creating another river through the city. In that way, going around the city and along the river may have been the least unkind thing the highway system could have done. While it's popular to think that 787 cut the city off from the river (which at the time was little more than an open sewer that flowed both ways), there were already significant obstructions, including the railroads and the lumber district. It is a shame that the old yacht club and the Maiden Lane pier were given up so easily, but at the time the riverfront was not considered a resource. That said, I'm not sure the worst impact of the highway wasn't the destruction of acres and acres of neighborhoods. William Kennedy's "O Albany!" provides a graphic depiction of what was lost in the South End and the Pastures. I believe Hudson/Jay Park did come about as the beginning of the build of the Empire State Expressway. The plaza was under construction for so long it's hard to figure out when some things happened. These plans came at a time when residential suburbanization was in full swing, but the idea that major employers would build their offices out in the middle of nowhere was still new and a little incomprehensible. The expectation was that the systems would have to continue to accommodate growing flow from commuters into Albany. Given that, it's interesting and telling that these plans, a relatively short time after streetcars had passed from the region, make absolutely no mention of any form of mass transit, let alone bikes or pedestrians. It's all about the car. ahhh this was great! I looked into this a little over the summer into this but didn't find out much, sooo interesting to find out! Thanks! I think they should finish the Dunn Memorial ramp right to the train station even now. I direct connection between the Thruway and Northway still makes sense, especially now with the Thruway adding a third lane in each direction between 24 and 23. This would be an ideal time to do it. This is a pretty fascinating subject that I've looked at from time-to-time. Another interesting parallel development was the abandoned I-92 concept. It explains why US 4 is two lanes in NY then becomes an interstate grade highway in Vermont. Imagine an interstate highway starting in Glens Falls and going all the way to Calais, Maine. As usual, the planners ran amok, but the state ran out of money long before we got that far. Cool article, thanks for posting it. I still loathe Albany, but it's nice to know it could have been worse. Great article Carl! Where can we get better copies of the maps? The one highway addition that Albany still needs desperately, in my opinion, is a direct ramp off the Northway to the airport. "Exit 3" seems perfect. Wish they could get that moving along. Thanks very much Carl and AOA. GREAT Article and posting (and comments that followed were good also). THANKS very much for taking the time to do and explain this. and thank you for the book recomendation. I just ordered it from Amazon for 2 dollars, with free shippping. During my upbringing, I was taught what the Dunn Memorial/Rensselaer Bridge to Nowhere was and why it happened or what it was supposed to go to, but never knew the rest of this and so now I understand what the tunnels under the plaza are for, and I always wondered that. I also always wondered about corporate woods and also about the missing exit numbers on the northway. Sort of like how I-90 never had an Exit 8 during most of my life, but now it has been built and added. when I was younger, I used to back in and park at that dunn memorial extra lane for the Albany, 4th of july fireworks display, but I don't think they allow that anymore. Then, I used to go up the hill, to the Route 4 hill, in north greenbush, but that has gotten changed now also. Thanks to the OP for this posting and thanks to everyone for the comments. Fascinating article! I didn't know any of this. My parents met a tea dance at Albany's Yacht Club, doing the Peabody! My dad was a Senior Draftsman at NYS D.O.T. and brought home a very detailed set of blueprints for the Washington Park exchange. I've only kept a few of his things, but I'll take a look. Wow, I didn't see this article before. This is excellent, Carl! Absolutely fascinating and answers so many questions that have plagued me about this town since moving here in '99. As much as I think these plans seem silly now, I do love when people dream big for Albany. My dad bought three apartment buildings at the corner of Hudson Avenue and Swan Street, the location of his barber shop. The reason for his purchase was the anticipation of this road construction. He was told of the proposed highways by, then, Governor Rockefeller's staff. As a kid, I saw a scale model of this project. Before my father had the chance to buy more of the property on Hudson Avenue, he passed away in 1965. Rockefeller's secretaries "volunteered" to "take the property off of my mom's hands" for a mere pittance of what it was proposed to be worth. Being a confused widow, she succumbed to their "kindness," not knowing the potential of this property, although my brother-in-law and I suggested otherwise. As we now know, the passageways out of Albany never came to fruition. But the property Rockefeller's people "stole" from my mother conveniently became historical buildings, which likely yielded a handsome sum to the new owners. Incidentally, I use the word "stole" because the buyers payed a mere $39,000, which included two apartment buildings on the opposite side of Hudson Avenue, two stores, and the house we lived in on Hamilton Street. Now I'll let you decide whether or not the word "stole" is appropriate. Commenters seem relieved that the full plan did not come to fruition. But most of the plan was built, and it destroyed the city. The mid-crosstown arterial would have been worse, but the damage was enough to kill the city even without I-687. I-787 destroyed Albany's history and identity, and made the river meaningless. The approach to the Plaza gutted the heart of the city. The South Mall created a giant wall in the middle of the city. 787 is carried over wasteland on absurd bridges - for no reason. Had they built 787 at ground level, they could have converted it from a limited access interstate to a local road, and restored the riverfront. But the spaghetti bridges completely ruin the city. Seriously - how much worse would things really be in Albany if we had the mid-crosstown arterial? The city is dead. Most of the history is destroyed. The roads are a disaster. Albany is a dead city. Exactly not unlike Detroit, Rochester, Schenectady and other once-great cities, Albany is doomed to waste away. The interstate severely wounded Albany. Politicians ensured there could be no recovery. Paul, as someone who moved to this neighborhood long after this destruction was avoided, I want to thank you and your wife. Contrary to what some Sad Albanian(s) might assert, this action saved the city. (How much worse would things really be? Visit Syracuse for the answer.) Beyond just saving this neighborhood, the highway revolts of the 70s arguably created the template for opposing further destruction down the line. We all owe you, and all your fellow protesters, a debt. Mr. Steincamp, Harold Rubin & Reszin Adams were but a few of the staunchly resistant who inhabited the neighborhoods slated for demolition, and certainly it was their commitment that kept the pressure on and public. I was but a teenager who got more use then out of the stretch of the park that was saved than most before or since, so thanks. So I guess this is why the highway under the mall ends in a parking lot!?! ?